Analysis and design of real-time computer systems with various distribution levels from 1990 to 2008. Modelling and scaling of the IT projects’ architecture from 2005 to this day. The first research trend pertaining to Analysis and design of real-time computer systems with various distribution levels begins in March 1989 after the defence of the habilitation thesis on Distributed simulation of communication systems at Humboldt University of Berlin in the Faculty of Mathematics and Natural Sciences. The thesis was published in 1989 as a monograph of the Academy of Sciences in Berlin. Short after the defence of the habilitation thesis, a series of academic papers is written which are published as academic textbooks. They contain the results concerning the design of systems simulation, modelling and simulation of distributed systems in telecommunication and informatics. Additionally, textbooks related to programming computer hardware for automaticians are written. Basing on the results of these works and on my own experience in the field, I continued the research adjusted to the needs of the real-time information technology. This work was supported by four State Committee for Scientific Research (KBN) grants, of which I was the director. As a result of this work, two books and publications in magazines and conference materials were written. They presented the results of the research for different distribution levels of real-time systems. The main goal of this research trend was to determine a consistent methodology of designing real-time systems. Analysis of the application of multiprocessor systems based on TMS320C8 X in real-time computations. Analysis of VME computers in data acquisition and turbine diagnostics in power stations in the real time. Overview and analysis of a field bus usage with PLC drivers for controlling the devices in the real time in industrial systems and laboratory work stations built in the department (programmable drivers, VME computers, industrial PCs, field buses, multiprocessor DSP systems, dedicated converter cards, software based on VxWorks, software for drivers compatible with the IEC 1131 standard). Analysis of multi-tier control systems integrating field buses, PLC drivers and supervisory units based on VME. The example pertains to the construct of a supervisory control and diagnostic system for supervising the correctness of work of the system controlling the accelerator. The application of the proposed methodology for the Swiss Light Source (SLS) accelerator project is described. Overview and analysis of distributed systems for transferring events. With corporate systems, there is a need to send information about different events that occurred in the system. The events are characterised by various importance and urgency of a response to the event. A model for generating and queuing messages for this communication system was proposed. Basic methods for the time domain are derived from the RMS methods formulated for a preemptive multitasking system. When it comes to message queuing systems, there is no analogical mechanism to preemption in multitasking systems, therefore, for the said systems, a separate methods of the time domain were developed. An analysis was performed for the class of interactive Internet systems with dynamically changing offers, in which the execution of a transaction can be cancelled if offers are outdated. System performance meters were investigated in the case when the number of started transactions per second can be hundreds or thousands. It was also assumed that a substantial number of transactions will pertain to one offer, and the execution of the transaction must take into consideration the results of the previous transaction associated with this offer. The presented class of systems is interesting from the practical point of view. One of the possible representatives could be the online stock exchange system, in which the transactions are executed in the real time. This model differs from the classical model of a stock exchange, in which sessions are defined. Therefore, the case of an online stock exchange, in which the user of the system keeps track of the stock exchange state and carries out the stock exchange transactions is considered. Determination of quality indicators for the mentioned classes of systems. The basic requirement of these systems was to fulfil the real-time conditions based on the time domain. The choice of a proper model for the description of the system class and the evaluation of a particular system’s project that is being created. Design of optimal solutions basing on the performed analysis and developed models. It was necessary to review many solutions pertaining to the analysis, modelling and design of real-time systems with various distribution levels. To do that, a group of experts that apply different solutions was invited to take part in research projects. The achieved results allowed for creating a common vision of designing such systems. The following eight publications were chosen as the most representative of this research area. The publication  consists of 16 chapters, the first 9 of which to page 251 were written solely by the candidate and the candidate was the co-author of the rest of the chapters. The academic textbook  was published at the same time. Chapters 5-6 and 11-2 of this textbook included the results of my own research carried out at AGH Faculty of Automation, whereas chapters 7-10, 13-14 and 16-17 included the results of the research conducted in Zakład Badań Podstawowych Elektrotechniki MPiH (Faculty of Basic Research in Electrotechnics of Ministry of Industry and Trade) and PAN Instytutu Elektrotechniki (Polish Academy of Sciences Institute of Electrotechnics). The book  constitutes a conclusion of the research conducted within this research trend. Exemplary publications [4, 5] from the ISI Master Journal List contain important work results for particular issues. The publication  comprises interesting results concerning the allocation of computational resources in a multiprocessor system. It needs to be added that immediately after the defence of the habilitation thesis, two books are written:  and . The first one presents a broad spectrum of notions related to designing the simulation of event systems and it was the first book in Poland in this field. The second book is a collective work of writers from many national and foreign centres which aims at presenting a broad range of issues concerning the modelling and simulation of distributed systems in telecommunication and informatics. The author describes in  the results of the simulation research on distributed algorithms. This textbook was also intended for doctoral students and research workers beginning the research on modelling the distributed systems. Werewka, J.: Distributed systems of control and data acquisition. Programmable drivers and field buses. (In Polish: Systemy rozproszone sterowania i akwizycji danych. Sterowniki programowalne i magistrale miejscowe.) CCATIE – Cracow Centre for Advanced Training in Information Engineering, Kraków, 1998. Werewka, J.: Programming computer hardware for automaticians. (In Polish: Programowanie sprzętu komputerowego dla automatyków.) AGH Script No. 1514, Kraków, 1998. Werewka, J. and Szmuc, T. (eds. ): Analyzing and designing real-time computer systems with various distrbution levels. (In Polish: Analiza i projektowanie systemów komputerowych czasu rzeczywistego o różnym stopniu rozproszenia.) AGH and Polish Information Processing Society, Kraków, 2001. Including: Tomasz Szmuc, Jan Werewka: Introduction (In Polish: Wstęp); Jan Werewka: Time domain of real-time systems. (In Polish: Analiza czasowa systemów czasu rzeczywistego); Adam Piórkowski, Jan Werewka: The issues of using component technology in distributed systems. (In Polish: Zagadnienia wykorzystania technologii komponentowych w systemach rozproszonych); Grzegorz Trybała, Jan Werewka: Application of database management systems in industrial environments. (In Polish: Zastosowanie systemów zarządzania bazami danych w środowiskach przemysłowych); Łukasz Dobrzański, Mirosław Gajer, Jan Werewka: The environment for testing the software for distributed robots control. (In Polish: Środowisko do testowania oprogramowania rozproszonego sterowania robotem); Tomasz Szmuc, Jan Werewka: Conclusions (In Polish: Zakończenie). Piórkowski, A. and Werewka, J.: Minimization of the total completion time for asynchronous transmission in a packet data-transmission system. International Journal of Applied Mathematics and Computer Science, Vol. 20, No. 2, 2010 (pp. 391–399). Werewka, J. and Dach, M.: Response–time analysis of a CAN network used for supervisory control and diagnostic systems. (In Polish: Analiza czasu odpowiedzi sieci CAN używanej w przypadku nadrzędnych systemów kontrolnych i diagnostycznych.) Control and Cybernetics, Vol. 39, No. 4., 2010 (pp. 1135–1157). Wala, K. and Werewka, J.: Allocation of computational processes in a multiprocessor system. Archives of Automation and Telecommunication, Vol. 34, Journal No. 1-2, 1989 (pp. 197-215) . Werewka, J.: Designing systems simulation – the simulation of discrete event systems. (In Polish: Projektowanie symulacji systemów – symulacja systemów zdarzeń dyskretnych.) AGH Script No. 1150, Kraków, 1989. Werewka, J. (coed): Modelling and simulation of distributed systems in telecommunication and infomatics. (In Polish: Modelowanie i symulacja systemów rozproszonych w telekomunikacji i informatyce.) eds. J. Filipiak, G. Schwarze, J. Werewka. AGH Script No. 1191, Kraków, 1990. 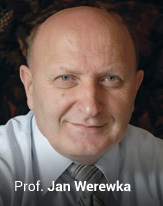 Including: Jan Werewka: Simulation studies on distributed algorithms. (In Polish: Badania symulacyjne rozproszonych algorytmów.) (pp.177-209). Development of scaling, mapping and integration methods for the selected agile and classical project management methodologies. One of the goals was to provide methods and tools for describing the company organisational assets and patterns of typical processes identified in the field of project management, particularly for companies from the IT sector. The basic quality indicators are the following: dynamic definition of organisational structure elements; scaling, that is adjusting the set of defined processes, their entries, exits and the roles to the size of projects and to the type and size of an organisation; adaptation to the organisational environment, specialisation of patterns; refactoring, that is the change in the project processes execution; processes composition; use of developed practices and patterns of behaviour but also for change and innovation. Development of general and sectoral reference models in order to evaluate the solutions and identify the application areas. These models are of great significance when it comes to research and practice. A variety of solutions in IT systems makes it difficult to identify the possibilities of integrating such systems. The development of reference architectures will enable the comparison of different architectures and determination of the solutions’ quality. It is assumed that the models of architectures that are created are based on the ArchiMate notation and will be mapped to reference models to enable the comparison of systems properties. Qualitative and quantitative analysis of architectures that use the reference architectures. In this area, assumptions are developed for the expert system that would help in making the right architectural decisions. Seven publications were chosen as the most representative of this research area. The candidate’s chapters in publications [1, 2, 3] describe the solutions to three problems, which in the field of project management and project process organisation seem extremely important and attract interest in the scientific and industrial community: the scalability issue in classical and agile methodologies, the issue of adapting the existing standards of project management to the conditions in a given environment, and the problem of integrating agile and classical methodologies. The publication  presents the example of using ontological models to integrate agile and classical methodologies. The publication  constitutes an example of mapping the cooperation between the company developing the software and the company at which the software was deployed. The presented methodology has the best solutions from the field of corporate modelling, architectures oriented towards services and models of deploying the software. The publications [7, 8] pertain to the issues of making the right architectural decisions with reference to SOA and with the application of the ATAM approach. Werewka, J., Lewicka, D. and Zakrzewska-Bielawska, A.: Project management in IT company. Vol. 1, Methodology and management strategy. (In Polish: Zarządzanie projektami w przedsiębiorstwie informatycznym. T. 1, Metodologia i strategia zarzadzania.) AGH University of Science and Technology Press, Kraków, 2012. Werewka, J. Tadeusiewcz, R., Rogus, G. and Skrzyński, P.: Project management in IT company. Vol. 2, Company knowledge acquisition and business modelling. (In Polish: Zarządzanie projektami w przedsiębiorstwie informatycznym. T. 2, Pozyskiwanie wiedzy i modelowanie biznesowe.) AGH University of Science and Technology Press, Kraków, 2012. Werewka, J., Nalepa G. J., Turek, M., Włodarek, T., Bobek, S. and Kaczor, K.: Project management in IT company. Vol. 3, Project management and software development process. (In Polish: Zarządzanie projektami w przedsiębiorstwie informatycznym. T. 3, Zarządzanie projektami i procesami wytwarzania oprogramowania.) AGH University of Science and Technology Press, Kraków, 2012. Werewka, J., Szwed, P. and Rogus, G.: Integration of classical and agile project management methodologies based on ontological models. (In Polish: Integracja klasycznych i zwinnych metodologii zarządzania projektami w oparciu o modele ontologiczne.) in: Production engineering in making, ed. Piotr Łebkowski, AGH University of Science and Technology Press, Kraków, 2010 (pp. 7-28).